Garlic belongs to the allium family that includes leeks, onions, and shallots. It is commonly found in most regions of the world and has long been used as a seasoning in cooking and even as medicine. Documentation indicates that garlic was a common food and medicinal resource dating back to ancient times for Babylonians, Chinese, Egyptians, Greeks, and even Romans. There are numerous health properties of garlic and some Oshkosh home care providers believe these benefits are especially useful for seniors. One clove of garlic is only four calories and contains vitamins B1, B6 and C. The vegetable also provides a steady source of calcium, copper, iron, manganese, phosphorus, potassium and selenium in addition to fiber. The diallyl sulfides found in garlic help the body increase ferroportin levels, which is a protein that has the ability to cross cell membranes and enables iron to travel where the mineral is needed. The sulfur compounds in garlic also boost the body’s immune system. Researchers from East Sussex in the United Kingdom performed a 12-week study involving 146 volunteers. One portion of the group was given daily garlic supplements. During the course of the study, individuals who took garlic and caught a cold or the flu experienced symptomatic relief 60 to 70 percent faster than those who did not consume garlic. Garlic’s sulfuric properties additionally offer anti-inflammatory, anti-coagulating and smooth muscle relaxation effects. These properties reduce cholesterol levels and dilate blood vessels, which reduces blood pressure. These health benefits are useful for seniors recovering from heart attack or who need post-stroke care in Oshkosh. According to scientists from the Shahid Sadoughi University of Medical Sciences in Iran, garlic increases estrogen levels in women and decreases the likelihood of bone loss. 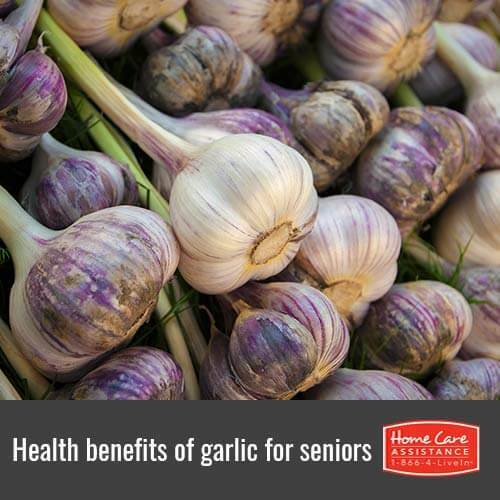 A steady diet of garlic may very well prevent osteoporosis among senior women. Garlic can be eaten raw, cooked, or powdered to enhance senior health, but some seniors may have trouble preparing healthy meals with it. Home Care Assistance provides flexible live-in and hourly home care Oshkosh seniors can depend on to help with daily activities like grocery shopping and nutritious meal preparation. Whether seniors need part-time or live-in assistance, our dedicated caregivers help seniors maintain independence during their home care experience. To learn more about our services, contact a friendly Care Manager at (920) 710-2273 today and schedule a no-obligation consultation.